Updated: 9:55 p.m. | Posted: 1:18 p.m.
A white nationalist group says its members have placed a memorial outside the Minneapolis Police Department's 5th Precinct to honor Justine Ruszczyk, an Australian native who was fatally shot by a Minneapolis officer more than five months ago. 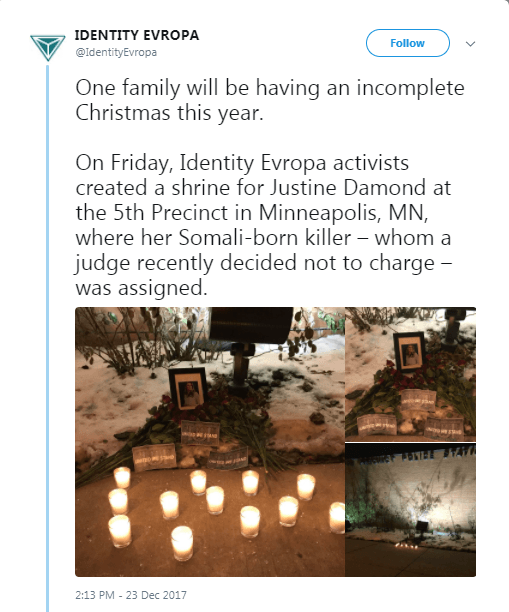 Identity Evropa, a California-based group that calls itself a "generation of awakened Europeans," referenced recent media reports about Hennepin County attorney Mike Freeman's comments on Ruszczyk. Freeman told a group of union members on Dec. 13 that he does not have enough evidence to decide yet whether he'll file charges against officer Mohamed Noor, and he blamed "investigators" for not doing their jobs. Identity Evropa, which is credited for coining the phrase "You Will Not Replace Us," labeled Noor as a "Somali-born killer." The Southern Poverty Law Center calls Identity Evropa a hate group and the Anti-Defamation League labels it a white supremacist group. Members of the group placed a framed portrait of Ruszczyk, 12 lit candles, roses and a sign that read "United We Stand" outside the police station. Noor had been had been assigned to 5th Precinct in the southwest part of the city. "One family will be having an incomplete Christmas this year," the group said in a tweet. In a later tweet, the group corrected its original tweet to say the Hennepin County prosecutor has said he doesn't yet have enough evidence for charges. Police Department spokesman John Elder said an officer cleaned up the memorial after the department was notified about it. "We cannot allow any memorial and anything like that to be put up at that location," Elder said. In a statement released Sunday evening, Minneapolis Mayor-elect Jacob Frey condemned the placement of the memorial outside the precinct. "I condemn the perpetrators and their tactics in the strongest possible terms," Frey said. "Identity Evropa and those who share their values have no place in our city. Hate has no place in Minneapolis. Period." Elder said Minneapolis police will investigate who was behind the memorial.